Remember that hilarious April Fools video that Namco Bandai released back at the beginning of April that teased an 80s-themed Dark Souls III movie? Well, as much as we’d all love for such a movie to be a real thing, it doesn’t look like it’ll be happening any time soon. However, Namco Bandai has, as a little gift to fans, released the mock VHS cover art for players to download and use as alternate box art for their own copy of the game. The announcement popped up on the studio’s Twitter page earlier today. VHS lovers! Download your VHS box art for #DarkSouls3! We have to say, Namco Bandai have perfectly nailed that 80s vibe – if only it had been available as an alternate cover as part of the retail release. Dark Souls III hit PC, Xbox One and PlayStation 4 on April 12, and – unsurprisingly – has been attracting some rather glowing reviews across the board. 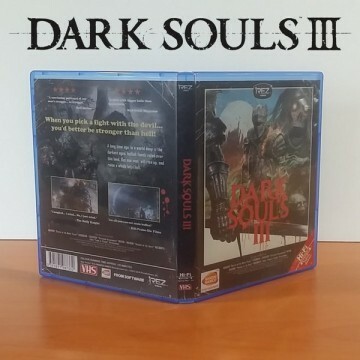 Our own Joshua Kowbel called it a “magnum opus of From Software Design,” and that it retains that same unique sense of perseverance and iron will as you explore, die and spout foul words as you fall foul of a single enemy countless times and then repeat the process until you emerge victorious.